Don't know what to make for dinner? Try this lean twist on a classic dish that your family will love. In a shallow bowl, combine 1/2 cup all-purpose flour, 1/4 teaspoon salt, and 1/4 teaspoon freshly ground black pepper. Dip 4 (4-ounce) thin chicken cutlets in low-fat milk; coat both sides of chicken with flour mixture. Combine 2 tablespoons fresh lemon juice and 2 teaspoons lemon zest; set aside. Heat 2 teaspoons olive oil in a large sauté pan over medium-high heat; add cutlets, and cook 2–3 minutes on each side or until golden and cooked through. Transfer to a plate; keep warm. Add the lemon juice mixture and 1–2 tablespoons capers to pan, scraping pan to loosen any browned bits; drizzle sauce over chicken. 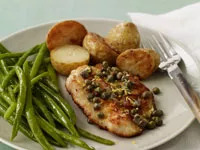 Serve with haricots verts and roasted new potatoes.